For our honeymoon, Aaron & I took a road trip down the East Coast. We stopped in Charleston, SC and we ate at Bubba Gump Shrimp Co. where we had shrimp & grits for the first time. OH MAN! It was SOOOO good. Aaron ordered it as appetizer and we liked it so much he got it as an entree too! Since you can't find shrimp & grits on a menu anywhere in Richmond, VA Aaron came up with his own recipe and topped it off with BBQ sauce. YUM, YUM, YUM!!! 1. Fry bacon to a crisp, crumble and set aside. 2. Peel and de-vein shrimp. 3. Grill shrimp on a skewer for 2-3 minutes on each side or until pink. Or fry over medium heat, each side until pink (about 5-8 minutes total). Saute garlic in 1 tbsp butter. 4. Bring water to boil, add grits. 5. Stir and cover for 5 minutes then turn heat to low. 6. Stir in cheese, remaining butter, garlic and salt. 7. Toss shrimp in barbecue sauce. 8. 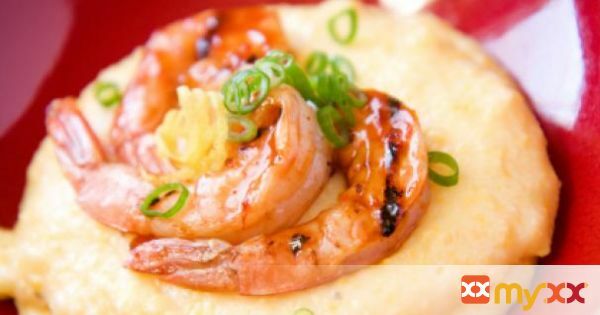 Layer grits, shrimp, bacon and scallions in a bowl and serve piping hot. 9. Top with additional barbecue sauce if desired.